This distinguished name is of early medieval Scottish origin, and is a locational surname deriving from the old barony of Aikenhead in Lanarkshire. The place is so called from the ownership of the lands by someone named "Aiken" or "Aitken"; this personal name is a peculiarly Scottish diminutive form of the male given name "Adam", itself from the Hebrew "Adam", of uncertain etymology; it is often said to be from the Hebrew "adama", earth. The second element of the placename is derived from the Olde English pre 7th Century "heafod", in Middle English "heved, heued", head, used topographically for a hill or the head of a stream or valley. In 1372, King Robert 11 (1371 - 1390) confirmed the lands of "Akynheuide" in the Sheriffdom of Lanark to one John de Maxwell, and in the same year, Convallus de Akinhead witnessed a land grant. William de Akinhede was a notary public in Irvine in 1444. 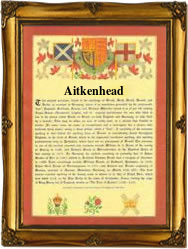 The modern surname forms are usually Aikenhead and Aitkenhead, and are found principally in Lanarkshire. Examples from that county's Church Registers include: the marriage of Janet Aitkenhead and William Auld in Glasgow, on January 14th 1669, and the marriage of David Aitkenhead and Mary Campbell on June 9th 1712, in Rutherglen. The first recorded spelling of the family name is shown to be that of Gilbert de (L)akenheued, which was dated 1296, rendered homage (Documents relating to Scotland in the Public Record Office), during the reign of Interregnum in Scotland, 1296 - 1306 - King Edward 1 of England, 1272 - 1307. Surnames became necessary when governments introduced personal taxation. In England this was known as Poll Tax. Throughout the centuries, surnames in every country have continued to "develop" often leading to astonishing variants of the original spelling.